I hadn't made this recipe for several years until my mom reminded me of it. These rolls are gooey and delicious. They're quicker to make than most similar breakfast breads because the dough only needs to rise once. I like to make these in advance, refrigerate the pan overnight, then bake the rolls in the morning. They're good when they're warm. We've, um, never kept them long enough to try them cold. 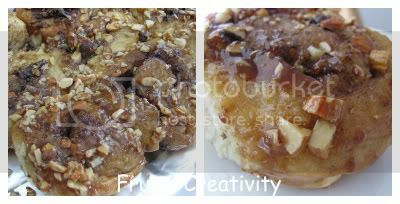 The recipe is from Pillsbury Chocolate Lovers II (Pillsbury Classics No. 49, copyright 1985). This is a great little cookbook that contains a few of my all-time favorite recipes, including the raspberry chocolate buttercreams pictured on the cover. I can't find anyone selling it now except on eBay. I've slightly adapted the recipe, and the comments in parentheses are my own. Grease 13x9-inch pan. In a small bowl, combine topping ingredients; blend well. Drop mixture by spoonfuls into prepared pan; spread evenly. Set aside. In large bowl, combine 1-1/2 cups flour, sugar, salt, and yeast; blend well. In small saucepan (or microwave-safe bowl, if you're using a microwave oven), heat water and 2 tablespoons butter until very warm (120-130 degrees F.). Add warm liquid and egg to flour mixture. Blend at low speed until moistened; beat 3 minutes at medium speed. Stir in an additional 1-1/2 to 2 cups flour until dough pulls cleanly away from sides of bowl. 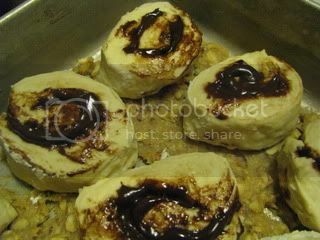 In small saucepan (or microwave-safe bowl) melt chocolate chips and butter, stirring constantly. Cool to consistency of soft butter. 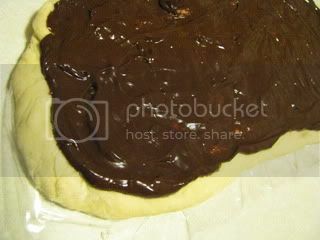 Spread over dough; sprinkle with nuts. Starting with 15-inch side, roll dough up tightly, pressing edges to seal. (I lifted the plastic wrap onto a cutting board so I wouldn't cut my countertop. Alternately, use unflavored dental floss to slice the dough without crushing it; that works well, too.) Cut into 12 slices; place cut-side-down in prepared pan. Heat oven to 375 degrees F. Bake 25 to 30 minutes or until golden brown. Cool 1 minute; turn onto serving platter or foil. Click through for more Chocolate Friday at Stop and Smell the Chocolates! Disclosure: The link to eBay is not an affiliate link, and I have no connection whatsoever with the seller. Oh YUM!!! I'm totally drooling! Those look and sound wonderful - great combo of flavors. Thanks for linking it up! Oh my goodness... those look insane! On my list for sure! This recipe sounds vaguely familiar, so I must have had this same cookbook at some point... The pics are great and make me want some! FWIW, I totally agree with your hints & tips you gave, especially about omitting the corn syrup, but I'm more of a sweet roll person, rather than a sticky bun person, anyway!